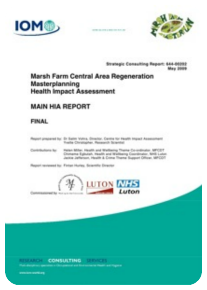 I led and project managed this HIA which found that overall, the redevelopment of the Central Area is likely to have a significant positive health and wellbeing impact on existing and new residents of Marsh Farm. It will be a powerful demonstration that things can and have changed for the better on Marsh Farm. However, there needed to some detailed planning in some key areas to ensure that the potential negative impacts are minimised and the positive health impacts maximised particularly on poor and vulnerable groups such children and young people, older people, women and those with young children and those with disabilities. Standards to which the housing will be built . Detailed design of the retail space and open and green space. The mix of tenure in the new housing and the criteria for allocating new tenants. Detailed planning for the relocation of health and other health/social services. Continuity of the existing shops and outdoor market and the criteria used to select shops for the new retail space being developed. Ensuring access to shops, the health and social services during the construction phase. Ensure the appropriate relocation of existing tenants. READ THE SUMMARY AND THE FULL REPORT BELOW.